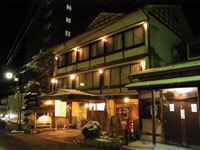 Hakuunro Ryokan is located near Nogano Railway Yudanaka Station and boasts the abundant amount of natural hot spring water and baths are open for always any favorite time. A small courtyard of the ryokan performs the change of the seasons. Meals are served in room. 5 minutes walk from Nagano Railway Yudanaka Station.